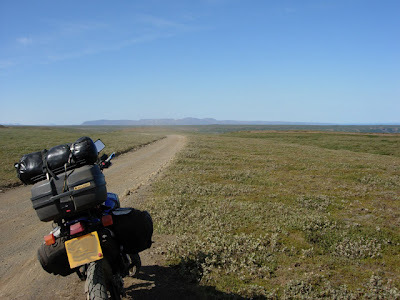 Continuing on northward from Scotland which can be read about here. After leaving Mike and Dean in the comfort of their tents in Thurso at around 3am I packed my gear up and headed to the port of Scrabster to board the ferry to Iceland. A number of bikes, cars and 4x4's were already starting to assemble at the docks. 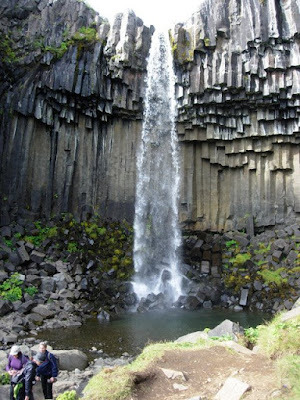 Clearly Iceland had enticed a number of adventure travellers. The ferry takes 36 hours and sails via the Faroe Islands which allows three hours ashore while it offloads and loads cargo. 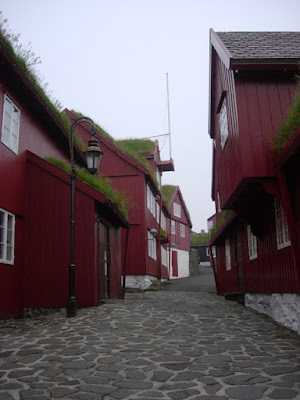 Traditional Faroese turf roofed houses. 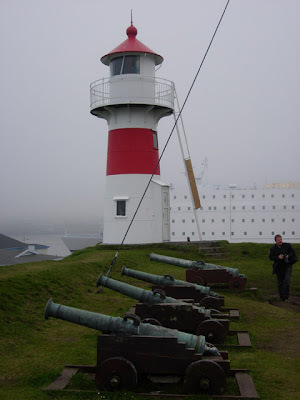 Overlooking the harbour in Torshavn. Back on the ferry with some supplies for the evening from the duty free shop it was time to settle in for the evening and the remainder of the mini cruise. Next stop Iceland. 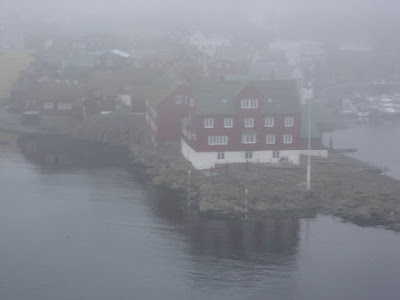 My first views of Iceland were just as foggy as my head courtesy of the duty free shop. Seyoisfjorour (Pronounced something like fnertlefnacker), Iceland. A somewhat clearer view of Seyoisfjorour. Once off the ferry I headed out of the ferry town and up the mountains that can be seen in the rear of the above picture. 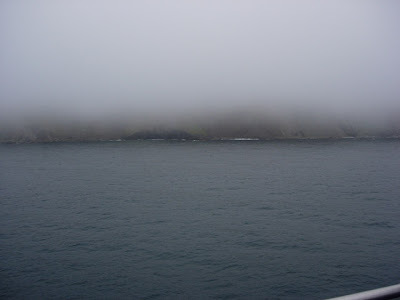 Thick fog/low cloud slowed the ferry traffic to almost a standstill. My first gravel roads in thick fog, riding a bike laden like a mule made my first tentative miles quite interesting. 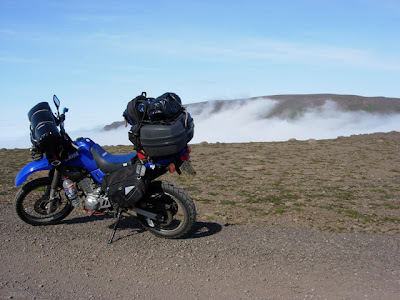 The traffic disappeared as quickly as the cloud as I rode above it into stunning sunshine and views. 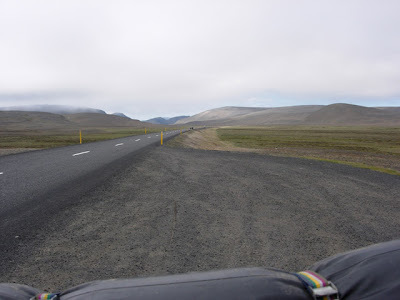 My general plan was to do a loop of the island in an anticlockwise direction taking in as many of the natural wonders I could that make Iceland the wonder that it is. 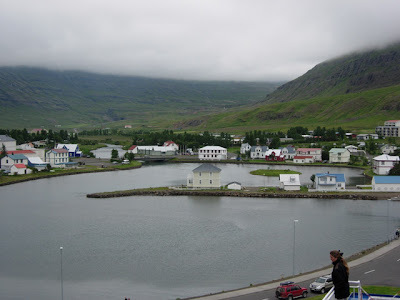 I had a small number of places I wanted to visit and after talking to a few people on the ferry that had been before, a few more places were added to the list. All the maintained roads are raised above the surrounding landscape to stop snow drifting during the winter. 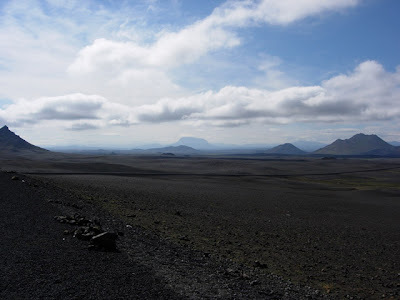 Mountains as far as the eye could see with a ribbon of tarmac through the middle. Making my way to Lake Myvatn (Pronounced something like mertalvansnerch) for a recommended campsite, I came across an area of steam vents. 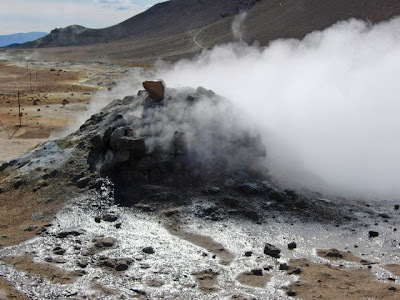 The smell of sulphur was overpowering. Not too dissimilar to Dean's farts! 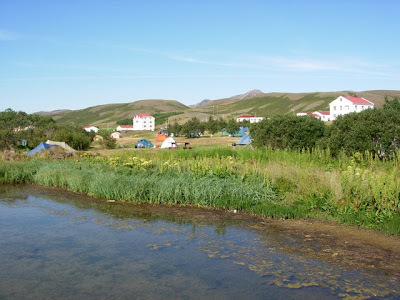 Campsite at Lake Myvatn. The facilities were superb and it was also one of the cheapest campsites I stopped at, costing around six quid. 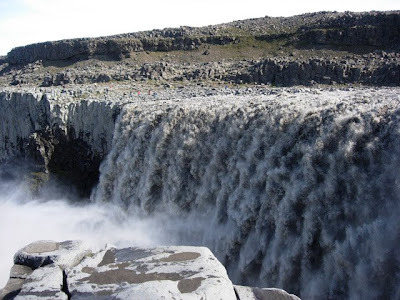 My plan for the next day was to do a waterfall sightseeing tour taking in three waterfalls that were highly recommended, and also ones that I'd researched before leaving. As usual with all Jangle jangles things didn't quite go to plan. I missed the turn off for the last waterfall and ended up one hundred kilometres away and decided to camp for the night and head back for it the following day. The road to the waterfalls Dettifoss and Selfoss (Most likely pronounced denheathenfloss and dentalfloss). I lost my camping chair on this track. The landscape everywhere was stunning but vast and was very difficult to photograph as there's nothing to give perspective of size. Vast emptiness and not a sign of litter! 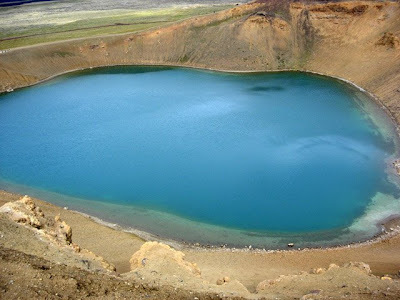 A trip to Iceland wouldn't be a trip to Iceland without visiting one of the many volcanic craters. 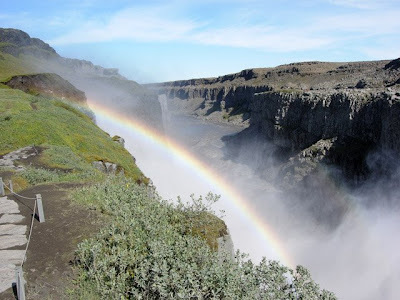 Well, technically 'a trip to Iceland' would still be a trip to Iceland whether you visited a volcanic crater or not.... 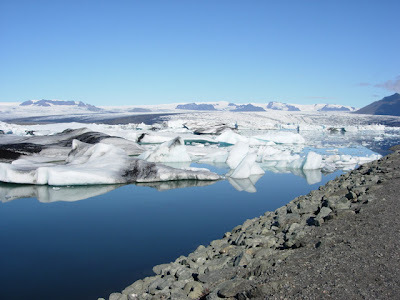 Similarly a trip to Iceland would still be a trip to Iceland whether you came back with a frozen chicken or not (Only British folk would get that joke... Not that it was funny in the first place). But obviously I'm going off the beaten track a bit here, so on with the show. (Last paragraph drivelled out by Mike whilst Loz went to the loo). 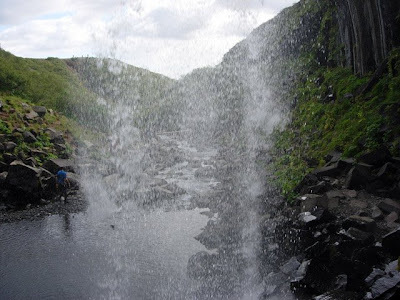 I returned back to Lake Myvatn to camp and planned the following day to travel the local area and also find the elusive waterfall that I'd previously missed. Volcanic crater at Krafla (No doubt pronounced muffetler). 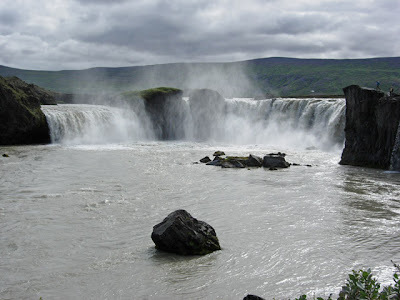 Godafoss, the elusive waterfall (flangefelcher?). 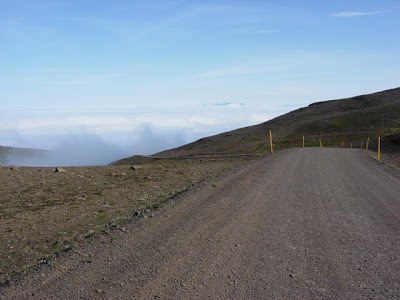 An example of the vastness and scale of things, if you look closely at the above picture you can just make out a small farmstead in the foreground of the picture by the side of the road. 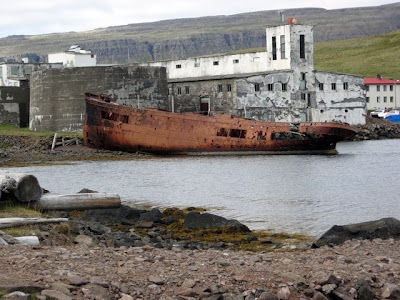 In the next fjord, a reminder of the main source of income; a derelict trawler and processing plant. Ever onwards and more sights to be seen and an area of geezers (and not the sort you find in the pub). 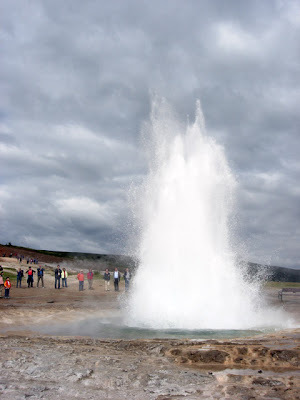 A geezer called Strokkur (Clearly pronounced pistonwipa). 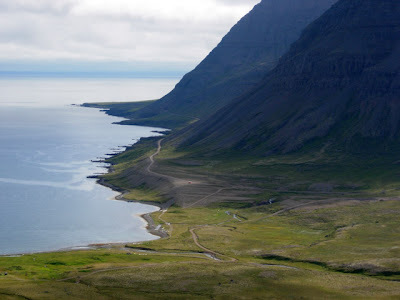 Heading south past Reykjavik along Route 1 and the southern part of the island, I happened across some natural sights I hadn't banked on or researched, which made their appearance all the more special. 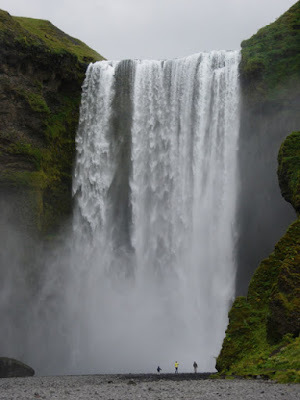 Skogafoss (Likely to have been pronounced norkfurnflunkle). Not too far from the above waterfall was an area of glaciers where I camped for two days on my return to the ferry port. 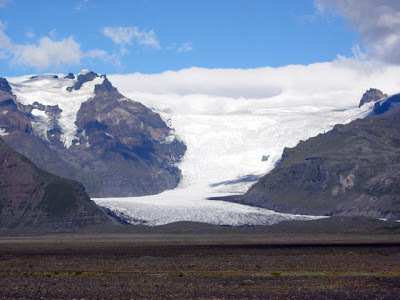 A glacier along the south east cost. A bizarre rock formation in a land of lava. A poor attempt at an arty picture from behind the waterfall. 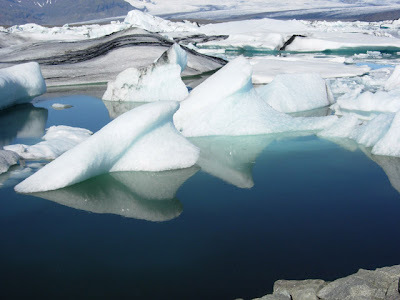 The glacier breaks into a lagoon. 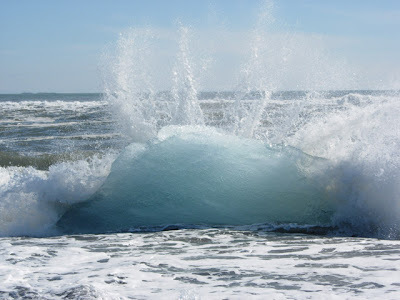 The icebergs then wash out to sea and get pounded along the beach by the waves. Although I'd planned to travel alone, every campsite that I stopped at had its fair share of fellow motorcyclists from all round Europe. I travelled for a couple of days with a guy called Stuart from Leicester. I also had a couple of very pleasant evenings with an Italian couple and a group of three French bikers. Although the language between us was very basic we still managed some jokes and piss taking. Just like being at home I caught the brunt of it. A short days ride from here took me back to the ferry port for the mammoth trip home. The homeward journey takes you back to Scotland via the Faroes but leaves you there for three days whilst it goes to Denmark. 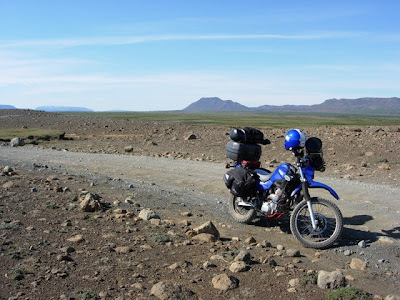 Back at the ferry port I met up with a number of bikers that I'd met in Iceland including a couple from Kendal and again the three French folk. 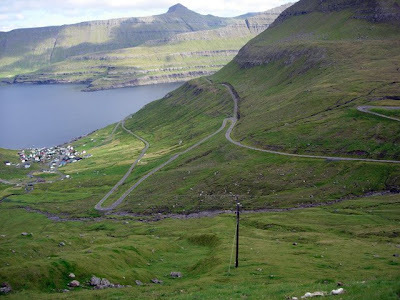 The road down to Gjogv on the Faroes (No doubt pronounced gruntlehoofer). A tiny harbour in Gjogv. 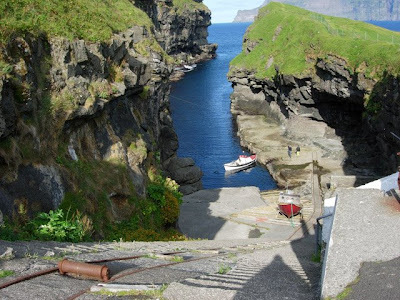 The Faroes was never a destination I had specifically chosen to visit so I didn't do any research prior to going and I had no plans for my three day stop over. A group of six of us spent the three days together travelling around the islands. We did accidentally stumbled upon a festival in the harbour of one village. 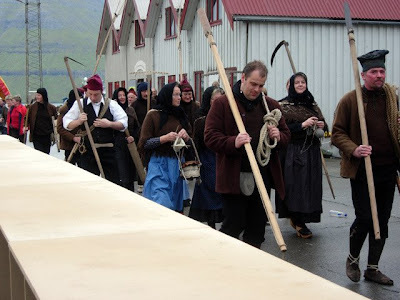 At this festival there were a group of Faroese bikers holding a crate stacking contest. On spotting our traditional fighting gear they deemed us friends, not foe and invited us into their enclosure and plied us with free coffee and cakes and a generous offer of workshop space if we had any mechanical problems. Oz (centre with orange hat) and Jess on the far right - The couple from Kendal. Second from right is Francoise who was part of the French group. Missing is Alain and Benoir. 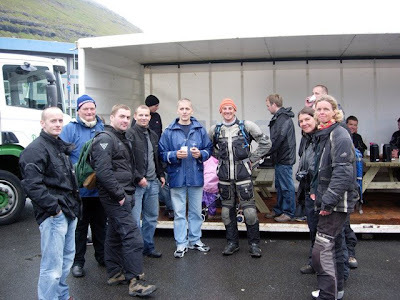 The rest of the group being the Faroese bikers who I'd like to say thank you to for their hospitality. I'd also like to thank Oz and Jess for their fantastic sense of humour that made the Faroe Islands bearable and the journey back through Scotland an absolute pleasure. As Mike would say; a thoroughly pleasant little Jangle. 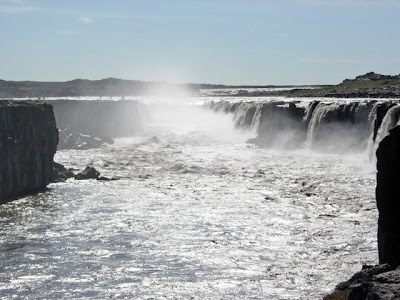 Some of you may be wondering where the write-up is for Loz's trip to Iceland. Well, I can inform you that it only has a couple of paragraphs to go. For Loz the job of uploading pictures and writing some spam has proved to be more taxing than the actual journey. This is mainly due to his 'puter having less oomph than a ZX Spectrum...... and I won't mention the accidental deletion of the nearly finished post. I'll leave you with a little taster of things to come.